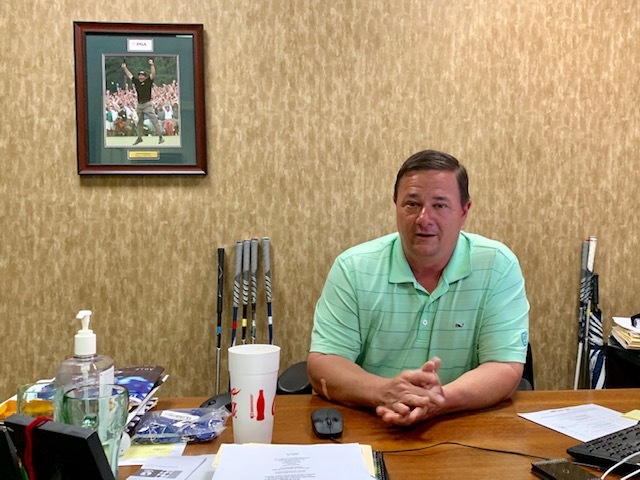 Anniston Country Club GM/pro Steven Driggers talks about getting his game ready for his first time in the PGA Professional Championship. There’s a picture on the wall behind Steven Driggers’ desk of Phil Mickelson’s legendary vertical leap from that time he won his first Masters. It’s on a plaque that recognized Driggers as the Player of the Year in the Mississippi chapter of the Gulf States PGA Section back in the day. The Anniston Country Club pro might be able to get a little more lift than that if things go well later this month and he just qualifies for the PGA Championship. Driggers is playing in the PGA Professional Championship at Belfair CC in South Carolina. The top 20 go on to the PGA Championship at Bethpage Black – the first PGA in May in 70 years – for their shot at fame and glory two weeks ago later. That means trading shots – on the scoreboard at least – with the likes of Rory and Ricky and Tiger and Phil. Of course, as one of the guys who work so you can play in that field he probably won’t get paired with any of the game’s megastars unless he plays his way into it, but just to have a shot at that dream has him excited. “Do you know how much fun it would be for not only me but for our members here for me to make it into the PGA Championship?” Driggers said. “That would be a blast for not only me but for them, too. Of course, his game has to be ready and the current state of it, he admits, is “like a million miles away” from that guy in the picture behind his desk and “really not close” to the guy who won that section award. He just hasn’t for a variety of reasons had the time to practice, which is the issue that gets most of the guys who play in this event. He figures he’s only played about a half-dozen rounds since the first of the year. “I am not ready at all, I’m quite a bit behind actually,” he said. “I actually just started practicing a week or two ago. My short game is in a terrible state right now. I’ve been focusing more on that than anything else. I feel like if I can just get my short game in halfway decent shape I’ll be OK, but right now it’s not good. Driggers, 49 next week, qualified for the national in September at Pensacola CC, shooting 4-under-par 140 to tie with Shoal Creek’s Eric Williamson, five shots behind medalist Todd McCorkle of Old Overton. The good thing is if he does sharpen his short game and make it through, unlike in years past when you qualified for the national championship in the fall, played it in July and then the main event until August – all during their respective clubs’ busiest times of the year – the window between the top 20 and the PGA is short enough the game can stay sharp. This will be his first trip to the national championship – he came close once before – but he has teed it up with the big boys before. Until recently he’s always tried to qualify for the U.S. Open, has played in the FedEx St. Jude Classic twice and played in a Web.com Tour that was an eye-opening experience. “It was fun to be out there and see how good those guys really are,” he said. “I got into a Web.com Tour event in Louisiana and the first day I’m coming up the 17thhole and I’m playing pretty good for me, 1- or 2-under, and I’m thinking I’m doing OK here. Well, the scoreboard behind the 17thgreen shows the leader is 9-under-par. I’m like well I don’t guess I was as good as I thought I was. The tournament has a 36- and a 54-hole cut for the 312-player event and Driggers’ first goal is to play all four days. In the meantime, expect to see him on the ACC grounds working on that short game every chance he can get over these next three weeks. “My high competitive days are probably in my rearview mirror,” he said. “To be able to qualify for this event where I am right now in my life is very rewarding. And if it turns out to be better than most, you can expect him to jump for joy. And a lot higher than Phil Mickelson did in that picture that hangs on the wall behind his desk. The tournament is April 28-May 1. All four rounds will be shown live on Golf Channel.